After owning Fire in the Lake for about a month and having only played the tutorial, I was excited for the opportunity to get it to the table with my fellow war gaming enthusiast friend Alexander. 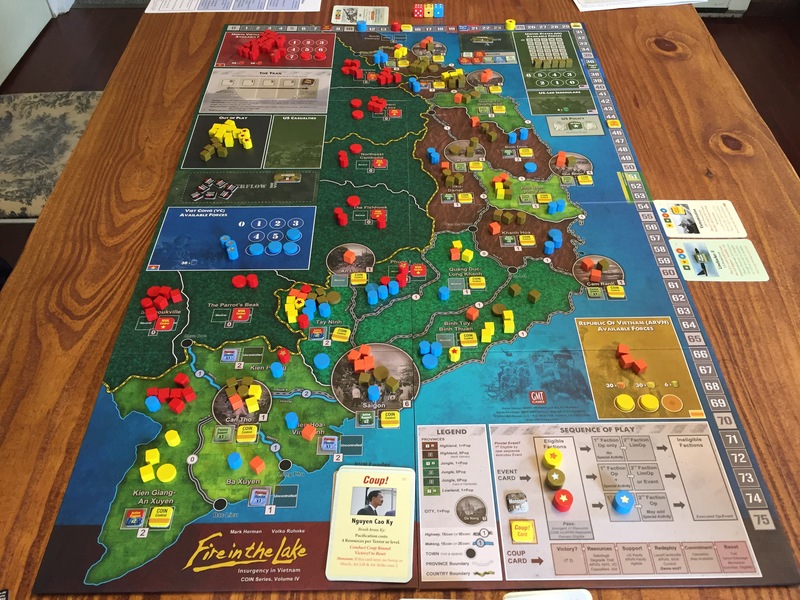 We set the game up for the medium scenario covering the years 1968-1972 and were initially surprised by the number of units on the board! 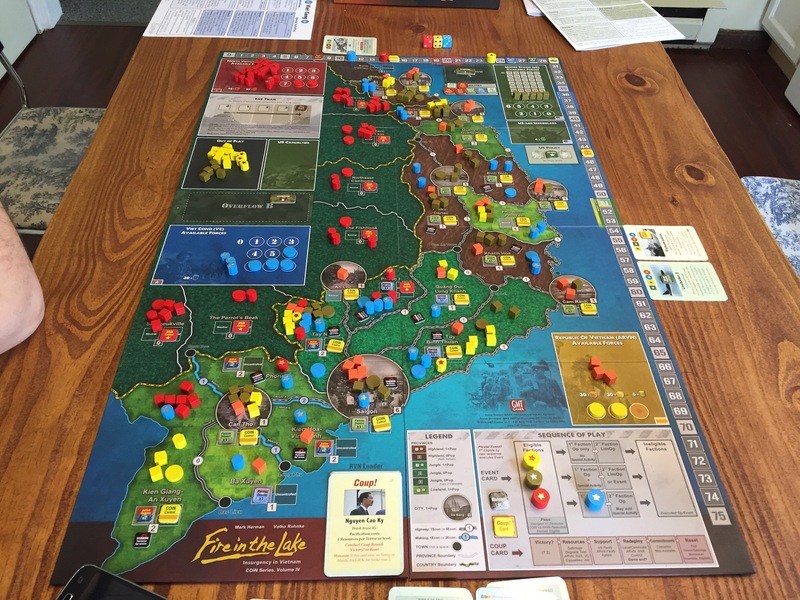 I played as the US & the Republic of Vietnam (ARVN) while Alexander would control the North Vietnamese (NVA) & Viet Cong (VC). After studying the various commands and special activities for our sides and reviewing the victory conditions quickly, we started our first game. We set the game up for the medium scenario covering the years 1968-1972 and were surprised by the number of units on the board! In playing the game for the first time I was surprised by the amount of units that each side already had deployed on the board. The COIN forces were firmly in control of each major city and also controlled a majority of the provinces. 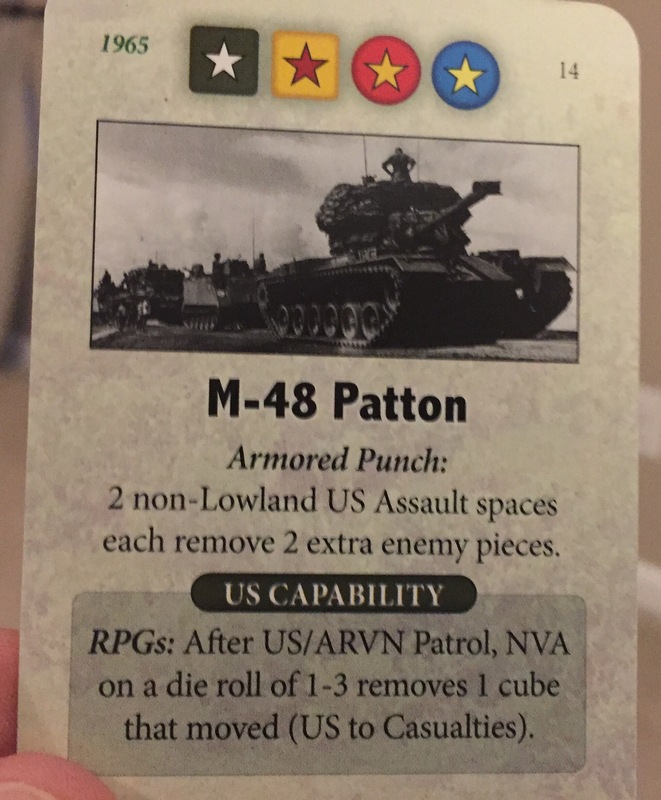 In reviewing the US capabilities, their Assault command seemed very powerful especially after having started the scenario with already having played the M-48 Patton Event which allows for the removal of 2 additional enemy pieces in 2 non-lowland assault spaces. The M-48 Patton was in US service until replaced by the M-60 and served as the US Army and Marine Corps’ primary battle tank in South Vietnam during the Vietnam War. I was also immediately concerned with the visible COUP! card that would be a thorn in my efforts in pacification until the 1st Coup! 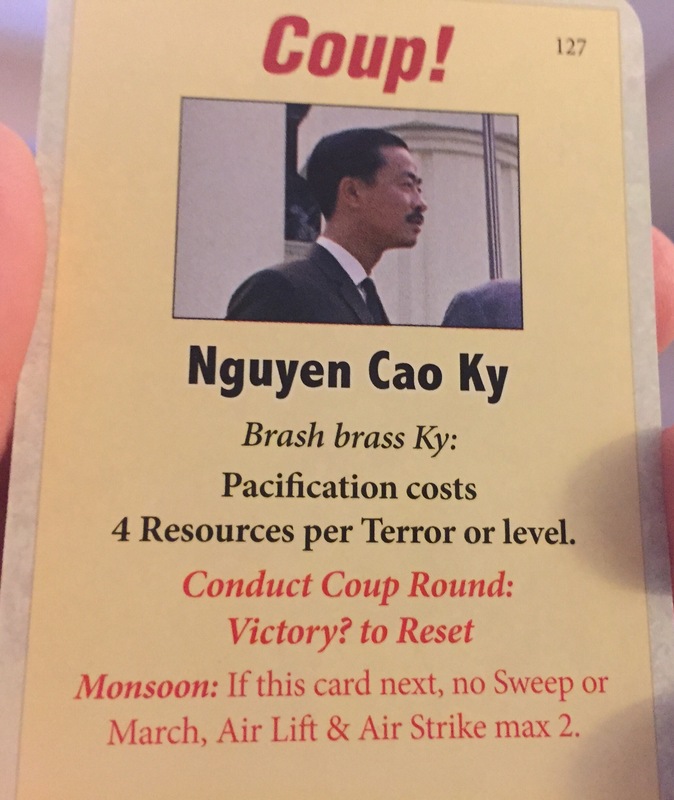 card would be played namely Nguyen Cao Ky. This would cause me to have to pay 4 resources rather than the normal 3 to affect the Support of areas. This is a major concern for several reasons but mainly because gaining support is one of the paths to victory and also makes life a little tougher for your enemies. I would have to simply learn to deal with this and make do. After the initial survey of the situation I took heart in the fact that I had the power and resources to succeed. One of my very first moves was to begin the slow process of ferreting out the hidden guerilla forces using targeted Patrol and Sweep commands to activate the hidden units followed up in later rounds with the use of the Air Lift special activities coupled with the use of the aforementioned powerful Assault command. This allowed me to fend off the numerous NVA forces in the Northern highland provinces of Quang Tri, Quang Nam and in Hue City. I also destroyed several VC bases in the south and felt very good about the situation until the VC played the ace up their sleeve – the Tet Offensive! I also destroyed several VC bases in the south and felt very good about the situation until the VC played the ace up their sleeve – the Tet Offensive! 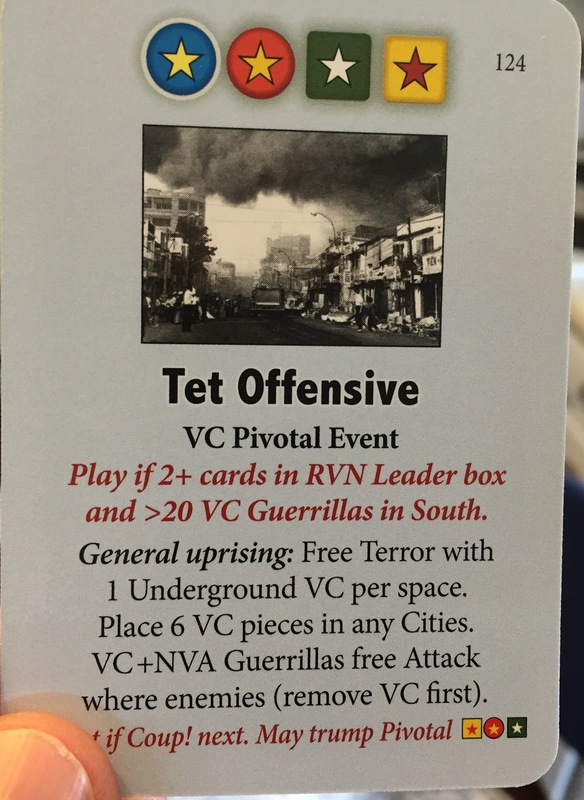 The Tet Offensive is a devastating attack on all provinces from Saigon to Hue that allows for the placing of terror markers in each space containing an underground VC unit. The terror markers are a serious impediment to pacification efforts as they must first be removed by paying 4 resources (see above discussed effect from Nguyen Cao Ky) so this attack basically ended my realistic chances of making any major moves at the end of the round in gaining support. The VC also are able to place 6 units in city spaces which can quickly disrupt things and remove any feeling of security. Here is a picture of the board before and after the Tet card was played. We played for a total of 4 hours (being interrupted by a potty training 2 year old and a hungry 5 month old infant always adds about an hour to any of our games) and finally hit our first Coup! card at which time we decided to call the game and check for victory. After the final tally, no one reached the required victory conditions but we counted back from the finish line to arrive at an ARVN score of -9 (9 points shy of their required 51), VC score of -11, US score of -12 and NVA with -14! 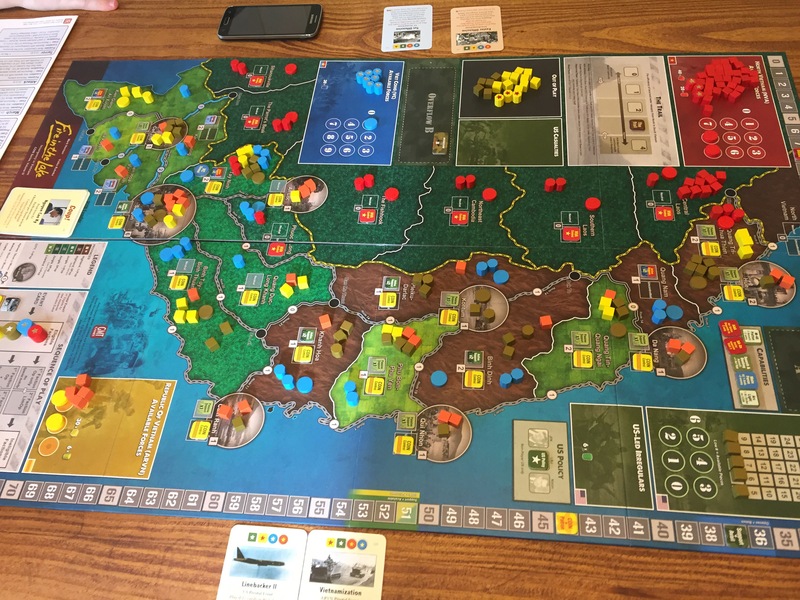 I felt the same about our experience and really have been impressed with the COIN (counter insurgency) series of games by GMT Games. In fact, I like them so much that I P500’ed (is that even a word?) both A Distant Plain: Insurgency in Afghanistan and Falling Sky: The Gallic Revolt Against Ceaser. Both of these games ship on Wednesday, April 27th and I’m very excited to open them, immerse myself in the history of the time and play! I will be looking forward to our next session of Fire in the Lake! Great on-the-scene report of first contact, thanks guys! As US, how did it feel to start with shaded “Search & Destroy” in play? Search and Destroy capability was also a huge advantage for the US. Anytime you can deal with and remove hidden guerilla units, it’s make you more efficient. We both realized how important the capabilities are and when we play a full game we will need to work hard to get ours through and stop the enemies from being played.